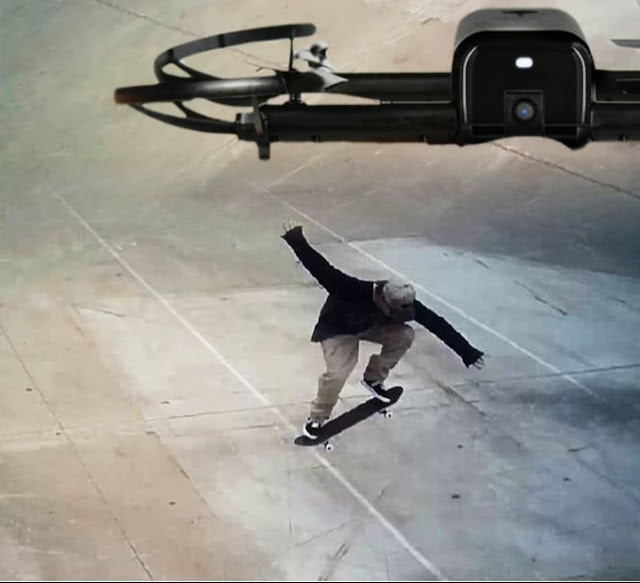 Flitt Selfie Camera Drone. Ollie by TET. The Flitt folds up to easily fit in your pocket or bag. The latest trend in drones is what's known as the 'selfie' drone. These drones aren't designed to fly extremely high or long distance, capturing panoramic views. Their purpose is, as the name suggests, to photograph or film the person controlling the drone itself. I've already written about the Pink Elfie Drone that I bought, which is just an awful drone for selfie work based on my own experience with it. For Christmas my partner bought me a Flitt Selfie Camera Drone, which, like the Elfie, uses an app on your phone as a controller, and is designed to be carried in your pocket. It's slightly more expensive but if you're looking for a great first drone I'd highly recommend the Flitt. The overall specs are about the same as an Elfie except the Flitt has a built in ground facing camera sensor that allows it to hover in one place without you having to constantly correct its position. You can position it, put the controller down, and film yourself - in my case, riding a skateboard. See the video below. This sensor makes all the difference, making the Flitt a breeze to fly indoors (where as my Elfie drone always managed to fly off course indoors before I could correct it with the controller). The other main differences is that the Flitt has a built in SD slot and supports up to a 32GB SD memory card. You don't need the card to use the Flitt but video and photos recorded to the card are of higher quality than those recorded to your phone. If the Flitt had a 'follow me' mode where it could lock on to its subject and follow along at a set distance as they moved it would be the perfect entry level selfie drone. As it stands it works more like a point and shoot camera. You need to position it for the photo or video you want to take then take the shot or record the video. For photos it does have timer and burst modes so you can get yourself into the shot and select the exact shot you want from a burst photo. Video resolution is 720p @ 30fps. The camera can be manually positioned straight ahead or angled downward. Flight time is about 8 minutes per charge with the battery taking about an hour to recharge. Additional batteries and chargers are relatively inexpensive so purchasing a second of each may be worth while if you think you'll use this a lot. Personally my interest in drones is with these pocket selfie models. They seem like a great way to expand your shot range without adding too much extra equipment to your camera bag. Whilst my first attempt at filming myself skateboarding with the Flitt wasn't a great success, as it was hard to tell where I needed to be, to stay in shot, I feel it does have potential. I'm looking forward to experimenting with it more. Footnote: If you're a drone reviewer, reviewing a selfie drone, please stop testing these things like they're an RC Helicopter and start testing them like they're a flying camera designed to take photos of people in the environment. It's not about how well they fly, it's about how still they can hover when taking a photo or video of the drone operator... i.e. how well they can take a selfie.